LAS VEGAS, Jan. 4, 2017 /PRNewswire/ -- INTERNATIONAL CES -- D-Link today announced two new whole-home Wi-Fi solutions, the Covr Wi-Fi System (DKT-883) and the Covr PowerLine Wi-Fi System (DHP-W732AV). The Covr Wi-Fi system is a simple, intelligent solution that uses a high-performance router and seamless extender to create a single network with ultra-fast speeds and reliable connectivity, to even the farthest reaches of a home. The Covr PowerLine Wi-Fi System (DHP-W732AV), one of the first whole-home Wi-Fi solutions to utilize PowerLine technology as a foundation, uses the existing home router and a set of adapters to create a full coverage solution. While other mesh network solutions rely on multiple access points, D-Link's Covr Wi-Fi System uses a premium router as the backbone of the wireless network. 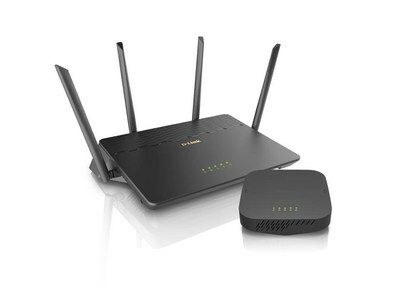 The router provides the advanced features and speed needed to power bandwidth intensive activities like 4K streaming and gaming on multiple devices. Combined with seamless extenders to cover hard to reach areas, Covr delivers a Wi-Fi signal to all areas of the home including upstairs, basements and backyards. "D-Link's Covr technology transforms the traditional router-extender solution to an easy to use Wi-Fi System that eliminates the hassles of traditional Wi-Fi while blanketing an entire home with a reliable, fast signal," said Anny Wei, president, D-Link. "Covr is a breakthrough system with advanced networking features designed to address today's home Wi-Fi needs." D-Link's line of Covr products utilize award-winning Wi-Fi solutions with self-organizing network (Wi-Fi SON) features from Qualcomm Technologies, Inc., a subsidiary of Qualcomm Incorporated, to simplify networking and deliver exceptional whole-home coverage. "With consumer demands for better broadband experiences on the rise, it's important for OEMs and technology providers to collaborate effectively on the right challenges," said Gopi Sirineni, Vice President, Product Management, Qualcomm Technologies, Inc. "D-Link's new Covr device, armed with our Wi-Fi SON solution, is designed to ensure consumers will have a seamless, reliable and high quality experience throughout their home now and into the future." The Covr PowerLine Wi-Fi System (DHP-W732AV)1 creates a whole-home Wi-Fi network using advanced PowerLine technology as the foundation. PowerLine uses the home's existing electrical wiring to transfer network data, essentially turning electrical circuitry into a high-speed wired network and making every power socket a potential network outlet3. Using the existing home router, the Cover PowerLine Wi-Fi System extends Wi-Fi coverage to hard-to-reach areas of the home as well as the wired network. 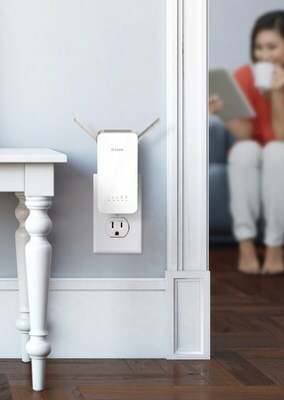 Featuring three Gigabit Ethernet ports per adapter, users can connect computers, smart TVs and other devices, eliminating the need to run Ethernet cables throughout the home. As more devices are added to Covr's network, its intuitive features take away the complexity of managing a home wireless network. Smart Steering technology works to balance the load between the 2.4 and 5GHz wireless bands. Covr intelligently prioritizes activities and steers devices between bands as more devices connect, making sure each device has optimal performance. Covr, unlike a traditional router-extender solution, creates a seamless network with a single network name (SSID) which allows users to move throughout the home while devices automatically connect to the strongest signal, eliminating the need to disconnect and reconnect. Additional Seamless Extenders (DAP-1655) can be added to expand coverage in larger homes. 1 Covr PowerLine Wi-Fi System (DHP-W731AV) sold separately. 2 Maximum wireless signal rate derived from IEEE 802.11ac specifications. Actual data throughput will vary. Network conditions and environmental factors, including volume of network traffic, building materials and construction, and network overhead, lower actual data throughput rate. Environmental factors may adversely affect wireless signal range. 3 Power outlets and electrical wiring must all be part of the same electrical system. Certain electrical conditions in your home, such as wiring conditions and configuration may affect the performance of this product. A minimum of two PowerLine devices are required to create a network. Connecting this product to a power strip with a surge protector may adversely affect the performance of this product. For best results, plug adapter directly into a power outlet.